I have a TON of retired products that need to go!!! I didn't post any last year due to having a little one so I have a lot of stuff that needs to be sold. If you need pictures just send me a message or comment and I will be happy to provide a picture or description. Due to the volume of products I can not post individual pictures. Also, if you buy several products I will discount your price so once you decide what you would like just email me with it and I will get you a total. I am also happy to ship it to you so just provide me your zip code and I can get you a price for that as well. I do take PayPal: LMKM27@gmail.com is the email for the account. 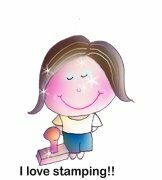 I am a stamp at home mom and Stampin' Up Demonstrator. I love to teach others to stamp and discover their inner creativity. Little Lamb Embroidery! Awesome site of customized gifts, shirts, and more!!! Create your own chick like below! Thank you for visitin my blog!! All photos are stamped images created by posted individual and are of Stampin' Up! unless otherwise noted. No images can be reproduced or copied by any means and cannot be sent for publication without consent. Please use photos for inspiration only.